Clopton, Debra. 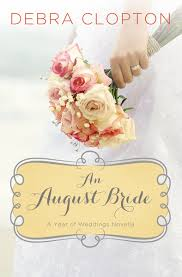 An August Bride: A Year of Weddings Novella. Grand Rapids, MI: Zondervan Publishing. 2014. A mermaid in gold, three members of the Matchmakin’ Posse of Mule Hollow and an irresistible cowboy…just the ingredients for a quick, humor-filled, adorable novella! Read in one sitting, I giggled as I read through the pages, truly enjoying the quick-wit with which it was written. I absolutely loved her 5 dating rules: no cowboys, no cowboys, no cowboys, no cowboys, no cowboys…whoa! Definitely deserving a place in A Year of Weddings Novellas, I must admit this was my favorite one so far! Having never read a novel by this author, I only hope her other ones are just as well written as I plan on reading all of them. Hill, Patti. Seeing Things. Nashville, TN: B&H Publishing Group. 2009. Just the kind of lady I hope to be some day (following in my mother’s footsteps), I enjoyed Seeing Things quite a bit. Full of humor, faith, struggles, relationships, forgiveness, and living life to the fullest, this book was definitely a treat. Though not always one to judge a book by the cover, I am certainly glad I did with this one. Adorable!! Perhaps a bit hard to start, a few pages in and I was hooked…very creatively written! Hard to believe I have never read a book by Patti Hill yet… but I sure will again now. Although maybe not an intention within the novel, I did learn a few things about macular degeneration which caused me to investigate the disease even a bit further. Thompson, Janice. A Bouquet of Love (Vol 4): Weddings by Design. Grand Rapids, MI: Revell Publishing. 2014. Landing a new job at Galveston Island floral shop, Cassia Pappas doesn’t have time to help her Greek family with the new restaurant they’ve just opened on the Strand. Torn between options, Cassia doesn’t expect to fall in love at the most inopportune time either. To make matters worse, her father has decided to steal customers from Parma John’s which is run by the town’s favorite family. Will Cassia succeed in her career? Will she follow her heart or her head? Can pizza, flowers and Greek food ever co-exist peacefully? 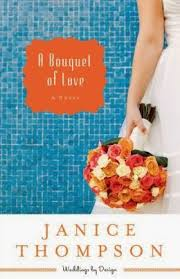 Full of total nuttiness, a bit of insanity, faith and even romance, A Bouquet of Love is fun, well written, delicious and sheer zaniness. Being the fourth book in the Weddings by Design series, as a new reader to this author as well as this series, I did not have any trouble enjoying it. Though I may have missed some references to previous characters, I was oblivious to it and it did not detract from my understanding though I do plan on reading the entire series (perhaps backwards at this point to stick with the wacky theme)! Writing this story during a particularly hard time in her life, Janice Thompson did an excellent job…God must have given her just the words she needed for this romantic comedy! Warren, Susan May. Evergreen. Carol Stream, IL: Tyndale House Publishers, Inc. 2014. Sparkling snow, chilly weather, swirling icicles…the perfect setting for a story at Evergreen Resort in Minnesota. With true perspective, Susan May Warren threads a story of a married couple later in life who have very contrastive thoughts of moving forward. Though only a novella, the storyline was truly developed and read as if a full-length novel. 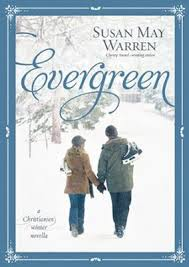 Following several other books in the series, Evergreen was included as a story on the parents (as I assume the previous books were about the children). Emotional, heart-warming and rewarding all the same, I appreciated the novella as a story within itself even though I was a bit confused as to the many characters mentioned in the beginning. A circle-story of sorts, the family Christmas letter at the start of the book soon turns into a much longer, more in-depth letter when rewritten at the end of the book. Another new author for me, I am sure this will not be the last from this author I will read. Shoemaker, Tim. 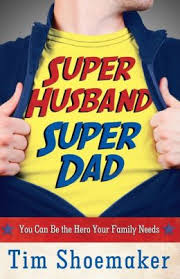 Super Husband, Super Dad. 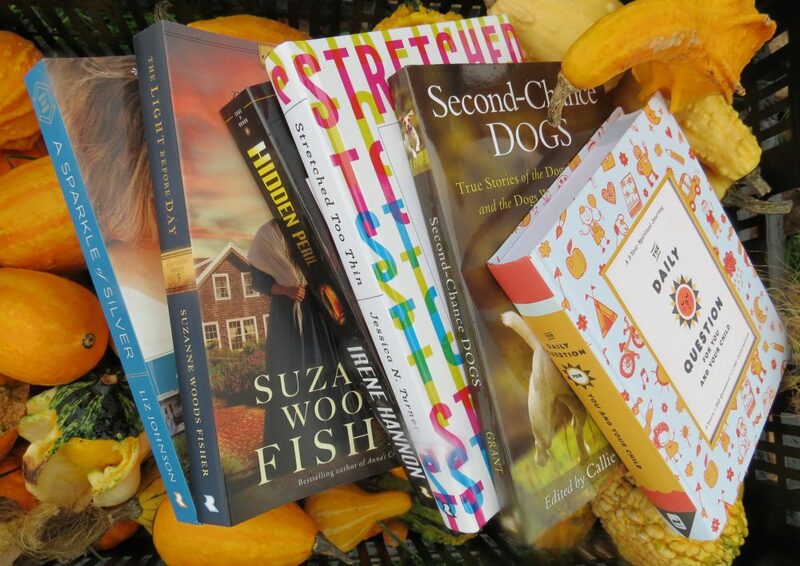 Eugene, OR: Harvest House Publishers. 2014. Though definitely written for men, there were points to help women understand men better (yes, possible). Following the “hero” theme including covers, chapters, pictures and icons, I liked the lay-out of this book which helped with the cohesiveness of the topic. The strong encouragement and recommendations coupled with Bible stories and examples make the information hard to refute and ignore. Absolutely a book to be shared with men of all ages and stages, it will challenge them to be even better men or even give them a chance to redeem themselves and live in God-inspired and blessed ways. Certainly a “hero” I would want in my life!! Nye, Thomas. Under the Heavens: Amish Horses Series, Book 1. USA: CrossLink Publishing. 2013. Vividly worded to share life on an Amish farm, Thomas Nye does a splendid job of descriptive writing. Draft horses, thunderstorms, pastures and family barns all become real as the story progresses. Having vast knowledge with Amish draft horses as well as Amish neighbors, the author weaves a beautiful tale involving both aspects. Throw in a bit of romance, faith, picturesque wording and an enjoyable story unravels even though I don’t find myself having much familiarity with horses. 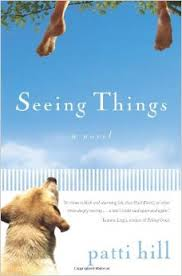 Though not necessarily a fast-paced novel, the softer, simpler side of reading comes through which I appreciated. 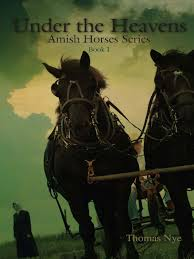 Book 1 in the Amish Horses series, I will consider continuing with further books in the series. Hubbartt, Scott. 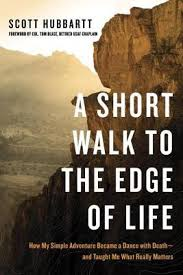 A Short Walk To The Edge Of Life. Colorado Springs, CO: WaterBrook Press. 2014. Actually this memoir would never have needed to be written if the author had smartly relied on his highly skilled survival training and basic adventure guidelines. However, it was written due to his lack of preparedness and fortunately ended well with lessons learned, determination strengthened, and faith/ trust in God developed. Overall, a rather slow story but with a good message shared. The included maps which chronicled his intended trek against his actual course of travel were appreciated and contributed to the understanding of his story. Sundin, Sarah. In Perfect Time. Grand Rapids, MI: Revell Publishers. 2014. A new author, a new series, a new time-frame and a new topic all played out in this one book for me. I wasn’t sure what to expect but it was more than I expected. 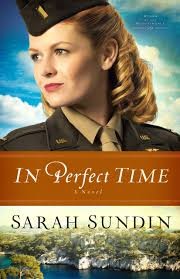 With an exciting storyline, vivid descriptions of aircraft and the period in history, intense scenes and of course, a bit of sweet romance all mingled with finding grace from God, In Perfect Time was truly a treat. Part of the Wings of the Nightingale series, this is the third installment. Although it could be read as a stand-alone as I did, it piqued my interest enough (and I enjoyed Sarah Sundin’s writing enough), to return to the two previous novels in the series to peruse. Young, Erin Taylor. 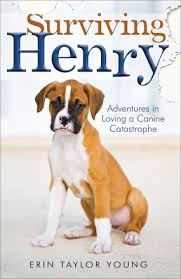 Surviving Henry: Adventures in Loving a Canine Catastrophe. Grand Rapids, MI: Revell Publishing. 2014. Having recently been in the same boat with our own pup (a rescued Great Pyrenees/ German Shepard mix affectionately named: Crazy Blazy Baer), I was excited to read Surviving Henry. With humor and grace, the author tells story after story of living with and actually surviving life with her dog, Henry. I found myself nodding in agreement, chuckling outloud and commiserating along with her as she bestows the facts of raising Henry. Though not going to the extreme measures she did, I could appreciate the peanut-butter-filled Kongs, long exhausting walks, territorial car rides and hugs (I give our pup lots of them). I also welcomed the lessons learned from Henry which concurred he was truly a gift from God. Erin, thank-you for not giving up on Henry, providing him a good home and sharing your story! Goutet, Jennie. A Lady in France. Printed in the USA. 2013. Not my usual genre of a book to read but I am actually glad I did! 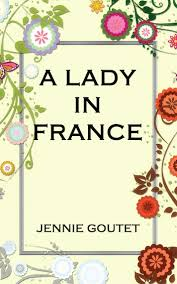 Beautifully written, author Jennie Goutet has a strong command of the English written language and it shines through in her memoir. Through achievements, loss, travel and experiencing faith, she shares her story which will make you consider your own course of life. Uniquely individual, I appreciated the honesty with which she conveys her story which is her own. The only problem I had with the novel occurred with the hard copy as the font was too small but it was easily fixable on my eReader version. I am not sure if the author has future writing plans, but if she does, I would definitely consider reading more of her work as I admire her manner of prose.